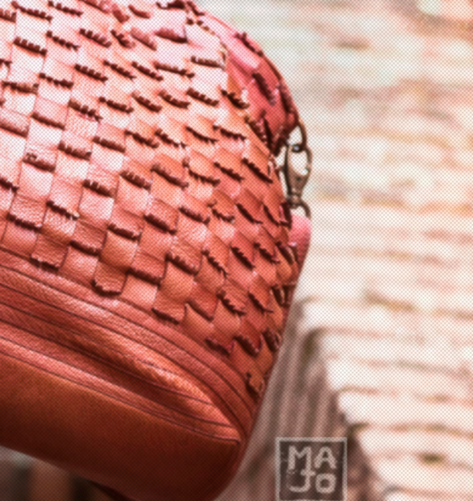 Majo bags are made using a very special technique. No punches or moulds are used, in contrast to common practice. The first step is a scrupulous selection of hides, which are then carefully prepared into strips. Then the body of the bag is made, worked as though it were a vase: the artisan sews the overlapped edges of a long strip of leather, using a specially designed sewing machine. Depending on her sensitivity, how much she pulls the material or allows it to loosen, the bag begins to take shape. Achieving this kind of ability requires long experience. Naturally, this means that each and every bag is different from the others. Desert Son of Santa Fe carries Majo handbags. Contact our shop for inquiries on our current inventory.